Weddings can be very serious events, so why not lighten things up a bit with humorous wedding cake toppers? There are many fun options for adding a little humor to your big day. 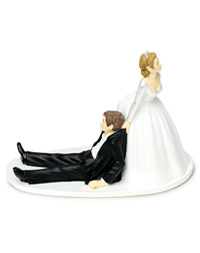 If you have a wedding theme for your big day, you can always find a cake topper to match that theme. If you want to stick to the classic bride and groom wedding topper there are some great alternatives to the classic wedding day pose. 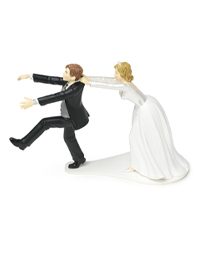 For example, the Oh No You Don't Figurine offers a humorous look at a bride trying to keep her soon to be groom from running away (shown below). Taking things one step further is the Now I Have You Figurine which shows what happens after the bride catches her soon to be groom who has a touch of cold feet (shown below). There are other options that don't include the traditional bride and groom. Cartoon characters, like Shrek & Fiona or Marge & Homer Simpson, are fun options especially if you are a big fan of the characters (or happen to look like them!). Your favorite movie can also be a great inspiration for a cake toppers, like Star Wars, or a favorite hobby like cycling or baseball.